Following a very successful 2019 Bernstein Piano Marathon at Rippon Lea last weekend, we are delighted to reveal that the Friends of the Team of Pianists Committee has organised a special fund-raising evening for the Team of Pianists, to support projects such as the Spring Piano School, the Classic Music in Historic Venues concert series, future Piano Marathons etc. 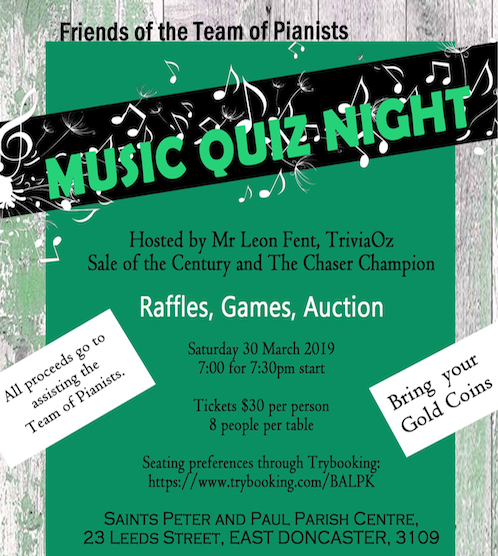 FOTOPS Music Quiz Night will be a fun-filled evening of music (and other) trivia and mayhem, with door prizes, games between the rounds, and a silent auction, all hosted by professional quiz master Mr Leon Fent (TriviaOz, Sale of the Century & The Chaser Champion). Come along and test your music and general knowledge - you can organise a table with friends or simply request to be seated at a table with a particular person or group of people, just email your seating preference to friendsoftop@yahoo.com.au or click on "Contact Event Organiser" in the Trybooking site linked below. Tickets are $30 per person, with bookings due by Feb 27 and a limit of 110 places. Do join us for a unique and fun-filled evening! Download the full poster here as well. or download the detailed 2019 Season Brochure. We hope you can join us for the Friends of the Team of Pianists' Music Quiz Night on Saturday March 30! or to be removed from the Team of Pianists email list, simply click on the unsubscribe button below.